Former Trump lawyer John Dowd wrote to the Cape Cod Chronicle that he would like to see the seal population around Chatham culled to alleviate the growing shark presence in the area. John M. Dowd, a former top lawyer for President Trump, has a message he wants to convey to the public: “The glorification of these dangerous predators” is careless. He’s talking not about the ruthlessness of politics these days but about great white sharks, of course. In a letter to the Cape Cod Chronicle that was published last month, Dowd, who has a home in Chatham, complained about the booming seal population and called for culling the herds to help mitigate the presence of great white sharks in the region. “I swim in Oyster Pond twice a day, but not any more. We have seals in the swimming area,” Dowd wrote, referencing the abundance of marine mammals that great whites feast on along the Cape. Dowd said the “glorification of these dangerous predators in Chatham is reckless” and argued that they threaten the way of life in the “beautiful” town. According to the 2018 Chatham assessor’s database, Dowd and his wife, Carole, are listed as trustees of a $2.2 million property in the seaside town, which is known for attracting not just sharks but the many beachgoers who flock there for the summer. A Virginia address for the owners of the Chatham property is also listed on the town’s assessment website and matches one for Dowd and his wife online. A woman who answered the phone at a number associated with the Virginia address identified herself as Dowd’s wife Monday, and she confirmed that her husband wrote the letter to the editor. Dowd hung up on a reporter when reached by phone Wednesday morning and said he didn’t want to talk about it. 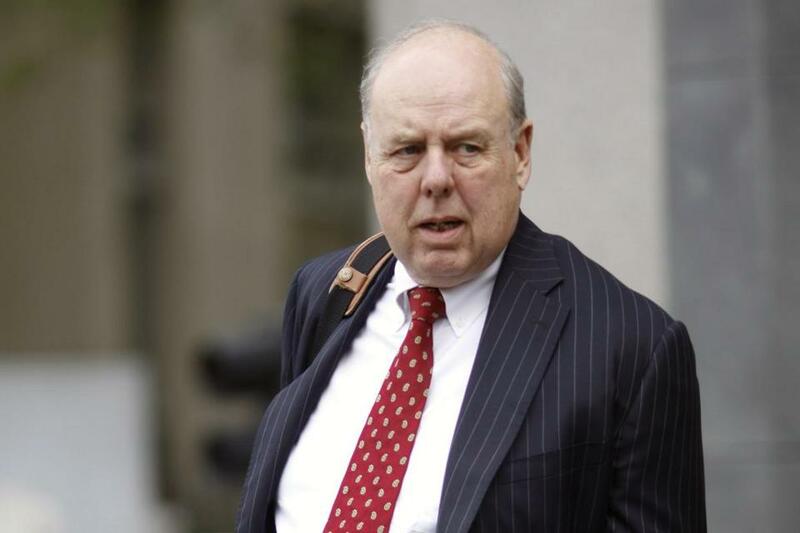 Dowd was the president’s lead lawyer in the special counsel’s Russia investigation, but he resigned amid a shake-up of the legal team back in March, according to the Associated Press. At the time, Dowd told the AP in an e-mail that his decision to leave the president’s team was voluntary — and had nothing to do with rumors that Trump had been ignoring his legal advice. Seals are protected under the Marine Mammal Protection Act, according to the International Fund for Animal Welfare, a nonprofit that sends staff and volunteers out to beaches to rescue hurt or entangled animals on Cape Cod. Because they’re a protected species, it’s illegal “to hunt, feed, disturb, or otherwise harass any marine mammal,” the group states. That is, unless you’re a great white shark. Gray seals are the preferred meal of the apex predators, and the thriving pinniped population is a main reason the sharks continue to return to the area. State researchers and the Atlantic White Shark Conservancy, who are leading a five-year study of the shark population off Cape Cod, said they spotted 149 great whites in July — up significantly from the year prior, the AP reported this summer. While Dowd called extolling the sharks a thoughtless act, visitors and residents have pointed to their presence as a boon for business in recent years, drawing curious tourists to the area in hopes of catching a glimpse of a fin. Although Dowd is no longer representing Trump, the two apparently have one thing in common: a dislike for the sharp-toothed animals. In an interview from 2011 with adult film star Stormy Daniels that was published by In Touch Weekly earlier this year, Daniels claimed during her brief affair with Trump, before he became president, he told her that he didn’t like sharks. “He is obsessed with sharks. Terrified of sharks,” she claimed the president said. Following the article’s publication, researchers from the Atlantic White Shark Conservancy said they saw a significant bump in donations to aid their work.